Space Game Testing Grounds is a space game prototype / exploration project. It's inspired by games like Star Trek Online, Battlestar Galactica Online, Homeworld and a few other. You have a direct control over a Mothership (very much like you have now). You can build and re-build how your ship looks and what statistics it has, you can add modules and do some simple RPG leveling. But your main force is your fleet - a combination of different classes of ships / drones. You build the ships/drones from blueprints you create or find - you use parts (for the hull and basic statistics) and then add active & passive modules. But you also can (and should) give them their brains - build their AI (like: always attack the biggest ship first, if you are below 20% HP retreat and repair, and so on). Once a ship/drone is build you have no direct control over it, but it will remain close to you and follow it's AI you've put in to it. Think Homeworld meets Diablo 2's Necromancer meets Gratuitous Space Battles meets Kerbal Space Program ship building (but no physics! so more like ship builder from Galactic Civilization). 7. This also means lots of experimentation, lots of changes and lots of things being made and then thrown away - it can get ugly! How the game changed in 21 updates (21 days of work). I invite everyone to take this gamedev journey with me! Few days ago while playing Star Trek Online and listening to some Game Developer Conference talk in the background I felt a strong urge to make a space combat thingy of sorts. But the funny thing is: a similar idea was my original impulse to learn Unity and it was my very first project I tried to make in Unity. It happen many years ago and ended up in a failure. That discouraged me quite a bit and I would use Unity only sparingly, focusing more on pure C# programming. I would seriously pick up Unity and game design only about a year ago. Going back to the present day - while playing Star Trek Online I noticed, with a surprise - "Hey, I actually NOW know how do this!" (or at least a single player version) - the whole last year of learning and creating seem to start paying off. A wonderful moment for me, to say the least. For starters, I don't have an end goal in mind - sure, I know what I would like to try and add to it - but I don't know what sort of game it will end up as, even if it will be a game. It can very well end up as single player space playground of sorts, as well as some multiplayer thing! I've also decided to stop hiding away my projects and share all the progress, even the smallest one, as I go along. Starting with day 1. I think this is also a great opportunity to try and find people interested it this sort of thing - a community - if I may be so bold. To test it with me, see what's missing and what can be build upon, and to discus all the space things. Having, for a change, no goal to be reached and no time-table to stick to is surprisingly relaxing! Update 002 - "Huston, we've got a ship!" 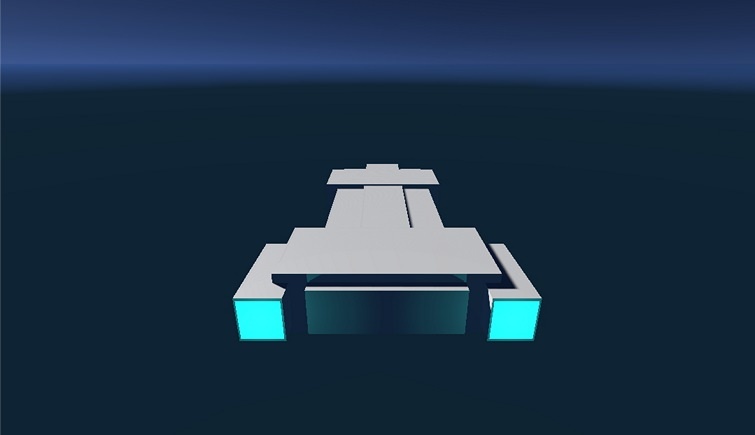 * [added] A new cube-ship model. * [added] New material for engines. * [changed] Updated lighting in the scene and cube material. * [added] Asteroid field generator with randomly distributed asteroids (using normal distribution). 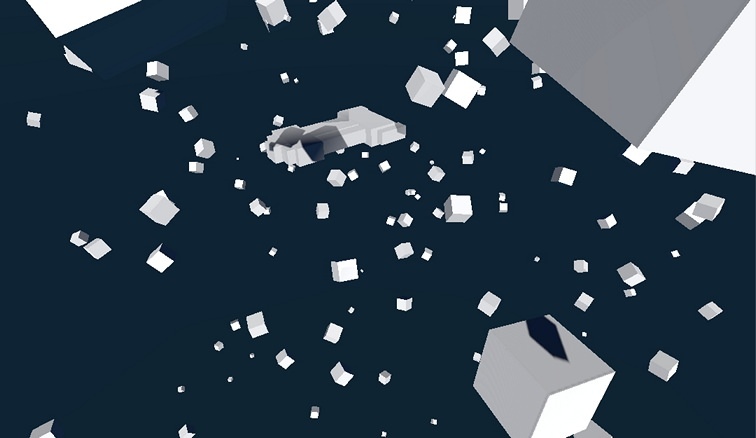 * [added] Each time the game is started a different asteroid field is generated for the player. 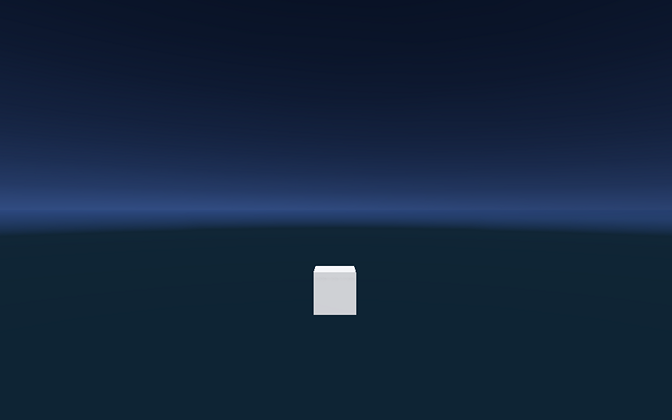 * [added] Orbit camera (no zoom yet). * [added] You can press a button on the screen to generate a new cube-asteroid field. * [added] [internal] Created a build script to allow me to spend more time on creating and less time on repetitive tasks. How are everyone this week? No new progress yet, but I wanted to share the script I wrote about yesterday. I used this Gamasutra article as a basis for it, but cleaned it up a bit and added creating a zip archive. Please remember to put it in a folder called Editor in your Unity project. Also you might need to change the paths (destinationFolder and destinationFile). It also assumes you have 7zip installed. This one script makes my life sooo much easier. I can spent more time on the project and less time doing repetitive tasks. Go automation! * [added] You can now use mouse wheel to zoom in and out. * [added] Generator option panel in place of the button with ease-in and out effect. 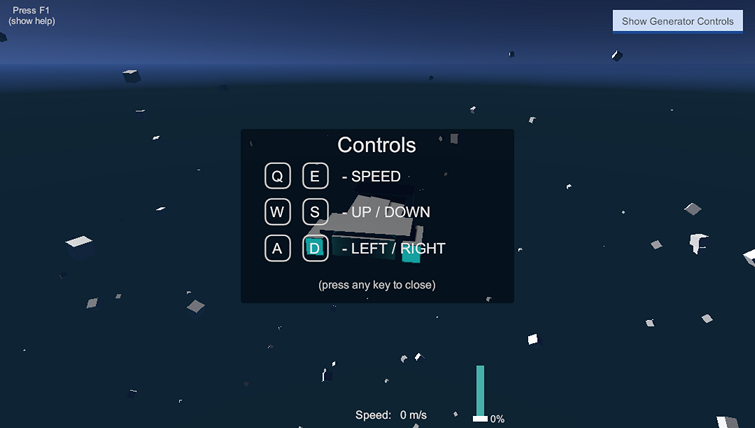 * [added] Controls for asteroid field size. * [added] Slider for asteroid count. * [changed] Zoom in now way faster. * [changed] Camera clipping plane is larger to show more asteroids. * [added] Camera angle are now restricted when looking up and down. * [changed] Game starts with camera being farther away. It might seem small but it makes it less likely to get lost while orbiting the camera (where is up and where is down). Now it works very similarly to how the camera works in Homeworld. In a way it promotes a feeling of having a "ground plane" despite there being none. Today I have for you the biggest update yet - flying! * [added] The ship can fly now! * [changed] The default asteroid field is much larder and there are more asteroids to accommodate the movement. * [changed] Asteroids are also bigger now. It took few days to get to this point, but we can finally move the dame ship! It's still a bit wonky and there is no UI but we will get there, eventually. Some people had problems with ship movement so for today I decided to add some UI elements for the ship control. * [added] Now you can change engine power with a slider! * [added] And there is a rudimentary speed display. The first version of a tutorial / help is up. * [added] A help window with the controls shows up when you start the game. Press any key to close it. * [added] Pressing F1 opens it up again. As for geometry I currently lean more towards pre-made module and assembling them at run-time. Do you have your project posted some here? I would love to see it! I tried this out and it was pretty fun, but here's some constructive critiscism. First, I was playing this on a computer without an f1 key so I couldn't acces the help screen. Second, maybe make the rotation more momentum based, ecause with the current system it feels kind-of jankey. And last, I would suggest replacing the speed slider in the bottom with something else, ecause it really just makes the q and e keys useless ecause they speed up and slow down slowly while the slider is instant. I hope this feedback can help you in your game design! Extra note: I'm using a chromebook right now which is asically a laptop that only runs google chrome and is missing the f keys. Also, I didn't really notice the slider doing any kind of gradual acceleration so I would suggest looking at that more. Final note: why do I never type my 'b's at all? Another note: I suggest using quaternions they would be good for rotation systems like the one in place. Thanks for the feedback, Kevycat! That's very interesting with the F-key - I think I will add a button, so you can click on it also. I agree, the rotation needs a lot more work. Do you think making the q/e keys change the throttle faster would help? I was going for a feeling - you set the desired throttle/power/speed level and the ship starts to accelerate to that. You feedback helps me a lot, please keep it coming! Some changes based on first player feedback! * [added] Zoom in / out now works with +/- buttons. * [added] You can also bring back the help screen with a button (thanks Kevycat) . * [changed] Help screen now shows zoom info. Thanks for updating the help screen! I also notice the the acceleration/deceleration seems better now though it might just be my imagination. The one thing I noticed that could be fixed is that the camera rotates the same amount no matter how zoomed in or out, so if you're zoomed really dar in it feels kind of slow but if you're zoomed really far out it feels super fast. I would suggest using a square root or something similiar for the speed, but linear could work too. And now time for some updates! 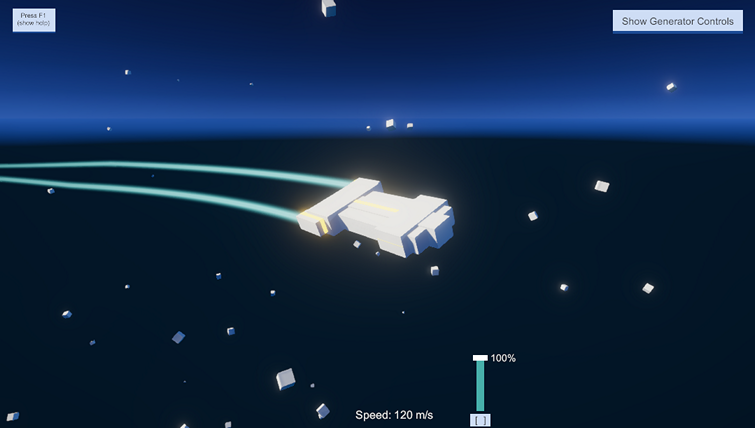 * [added] Engine glow is now depended on the engine power (throttle). * [added] Engine light effect is now also depended on the engine power (throttle). * [changed][internal] Lots of code cleanup and modularization. Play current build online here! I played the new version, and found a new bug. When before it would show negative speed if you were going backwards, now it just shows zero. Also, the asteroids don't have collision. 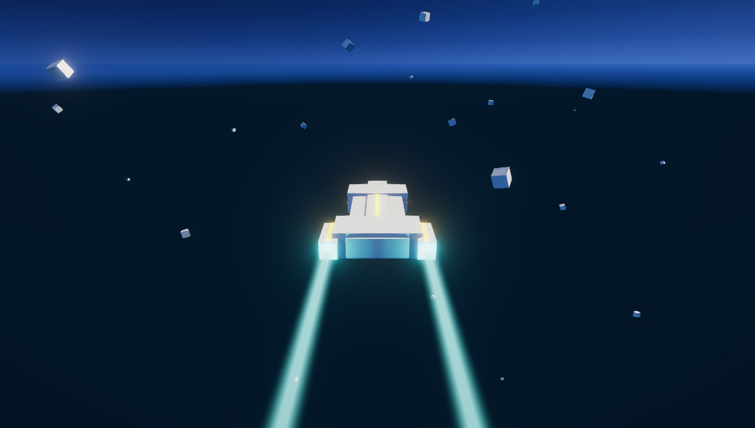 This might not be a bug, but I would suggest giving the space ship a rigidbody component so that it can bounce off of the asteroids. I got a question if may: I was thinking about removing the reverse speed altogether. The more I look at other games the more I think it serves no purpose. I think only 1 game in this style has it (Star Trek Online) and I don't think I ever used it there in any meaningful way. What do you think about if it was removed? and multiplayer: at some point I'd like to test it out - I haven't dug deep in to it yet, but from what I read it can be tricky to get the build-in physics going (and we are talking about star-system scale). I might be wrong here and I'm open to suggestions. With the reverse thing, I on't really know. Later on in the game it might end up being useless, but now it's good for more precise manuevering such as going into the center of an asteroid for fun. If rigidbody collision doesn't work, there's a unity function you can put on a script that triggers when you collide that's named onCollision or something. Yeah, good idea, I think I will use this feature you're talking about. Perhaps once I get to the shields, then I can combine it with the shield effects and damage. I will also know by then what ship's bounding boxes will be like. * [added] Based on a suggestion, now the camera rotation speed is depended on the distance from the ship. * [changed] Reverse speed can be set per ship. And is lowered by default. Will see what is the future for this feature. * [fixed] Camera rotation is now framerate independent. * [fixed] Negative values of speed and throttle should now work correctly (again, thanks Kevycat).